Feel free to suggest additions to this page by contacting me online on via Twitter @orbitingfrog. Astronomers are sometimes asked to defend public funding of their work. It’s difficult to answer because I really do think that there are lots of things we should do just because they’re interesting and enriching and that science shouldn’t be limited be what is economically beneficial. That said, astronomy is often given an easy ride because it is pretty and we have people like Neil deGrasse Tyson, Brian Cox and Dara O’Briain on our side. One approach is talk about how much useful stuff astronomy has produced. When you look around your life – and your house – you’d be surprised at how much is connected to astronomy and space exploration. Assuming you’re like me (i.e. living in the UK in 2013) you probably own several pieces of space-based technology. For a start you most likely use WiFi – in fact you might be reading this via WiFi right now! WiFi is based on work by John O’Sullivan working at CSIRO in Australia. The WLAN (Wireless Local Area Network) provided by your router results from technology developed by Radio Astronomers in Australia, More than a billion people are using it in 2013! There’s also your GPS device. GPS determines your position by receiving the signals given off by a network of satellites orbiting the Earth. By comparing the time delay in the arrival of the different signals, the GPS chip can figure out its exact latitude and longitude to within about 10m. The GPS system not only involves satellites but each of those satellites houses an atomic clock and must incorporate Einstein’s equations for general relativity in order to know its position precisely . It might be the most space-aged thing you own! There’s a small chance that you sleep on a Memory Foam mattress or pillow. Memory Foam was created by NASA in 1966 (in fact it was created by people being contracted by NASA) to develop a way to better cushion and secure people going in to space . Similarly iodine water filters derive from NASA work in the 1970s to create safe drinking water on long missions and scratch-resistant glass coatings were created to create better visors for astronauts. Contrary to popular belief, Teflon (the non-stick courting on saucepans) was not invented by NASA for the Apollo programme. In fact, it already existed and was simply used by NASA, who may have helped popularise it in industry at the time. I’ll also not mention CCDs here, since I’m no longer sure that astronomy had much to do with their success! . Outside of your home, there are many other places where the technology results from space research. There is a great deal of medical tech that comes from space exploration, which shouldn’t be surprising given that both fields are often trying to see or detect things in tricky or unusual environments. Software for detecting things in satellite imagery is being applied in medicine, including to detect the signs of Alzheimer’s disease in brain scan data. The detection of breast cancer tumours was vastly improved by techniques in radio astronomy and instruments than began as ways to delicately monitor the temperature of fragile telescope instruments is being used in neonatal care today. At the airport the X-Ray scanner uses tech derived from X-Ray telescopes  and they may sometimes check your bag or coat for traces of certain chemicals by placing it in a gas-chromatograph which was originally designed for a Mars mission . Astronomers are often also coders and software developers. As well being responsible for the 2008 banking fiasco (I’m joking, maybe) they are also good at creating software that others find very handy. The visualisation software IDL is many astronomers’ language of choice and was developed developed in the 1970s at the Laboratory for Atmospheric and Space Physics (LASP) at the University of Colorado at Boulder . IDL is used in lots of research today in areas including defence, climate monitoring and by companies like Texaco, BP, and General Motors . All of this is just the practical, modern stuff. Let’s not forget another thing you hold very dear: time itself. The calendar, especially it’s handy monthly segments, are astronomical in origin. The second, which seems so commonplace (i.e. it happens all the time) was defined in terms of the Earth’s rotation until astronomers realised that the length of a day was changing and so suggested a switch to defining it in terms of the Earth’s orbit around the Sun. Then we realised using an atomic clock would make more sense and handed our time-deiing powers over to the particle physicists . Finally I just want to say that yesterday a paper appeared on the arXiv titled ‘Why is Astronomy Important?’ and it prompted me to finished this blog post about astronomy in everyday life, which I’ve had kicking around for ages. 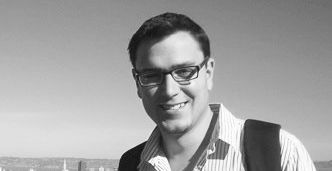 A big thanks to Marissa Rosenberg, Pedro Russo, Georgia Bladon, and Lars Lindberg Christensen for their timely paper – and their handy references! UPDATE: There are also two handy booklets on this topic from the Royal Astronomical Society, you can find them here and here. If you’re in to digital photography then you may have debated the benefits of the CMOS and CCD imaging technologies. All digital cameras, camera phones and webcams use one of these two types of tech. CCDs were developed in 1969 at Bell Labs (the 2009 Nobel Prize was awarded to its inventors Smith and Boyle) and they became very popular in astronomy. CCDs are said to have popularised by their use in the Hubble Space Telescope but I’m not sure I buy it and can’t find evidence for it. Solid, liquid, gas. 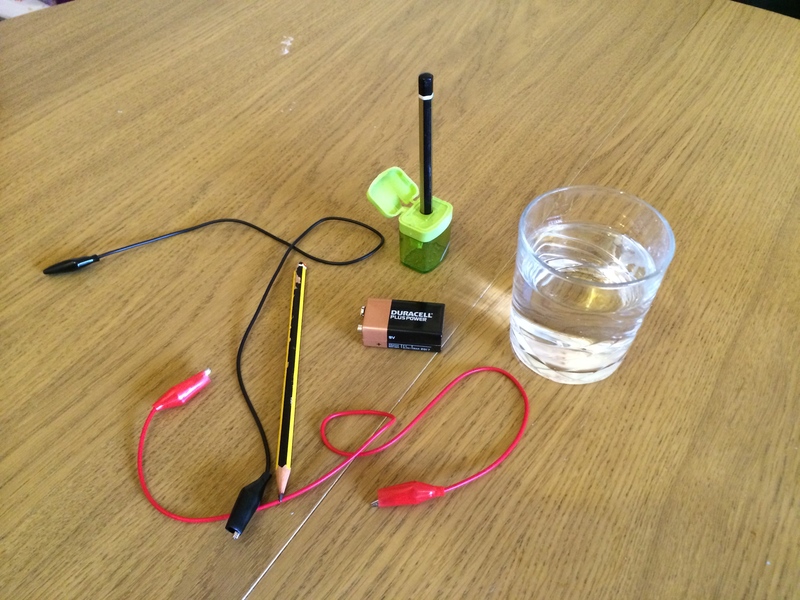 The three states of matter are something I first explored in primary school and water was the best example. You can easily see water frozen in your freezer, and it spews as a gas from your kettle. But if you mess with these normal states, you can do some fun and strange things with something as everyday as water. We’re all taught in school that water boils at 100°C and freezes at 0°C. This range was defined by a Swedish astronomer(!) called Anders Celsius when he devised the temperature scale that bears his name and which is also known as ‘centigrade’. It’s a very useful way of thinking about temperature. Rather awesomely, there is a way to cool water below 0°C without it becoming ice. The process is called ‘supercooling‘. 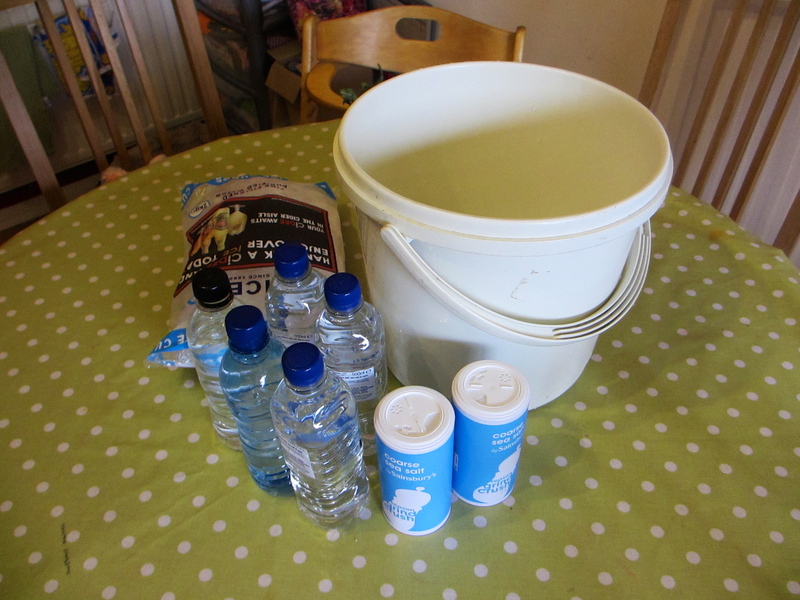 To try it you’ll need a bucket, some bottled water, lots of salt (we used 700g of the stuff doing this), and a big bag of ice. Supercooling involves lowering the temperature of a substance but preventing it taking a solid form. In the case of water you can supercool it way down (to about -45°C if you have the right kit) – just so long as you can stop ice crystals forming. Ice forms around ‘nucleation sites’ – places where ice crystals can get a foothold and start growing. These sites are usually impurities in the water or on the surface of some other material that its in contact with. So if you can get very pure water in a very smooth container, you can take it below freezing but keep it liquid. For that reason you should use plastic bottles of mineral water, but filtered water will work too. We used both here. Put some water into a bucket and pour all the salt in. Mix it up really well, and try and make sure the salt is all dissolved. 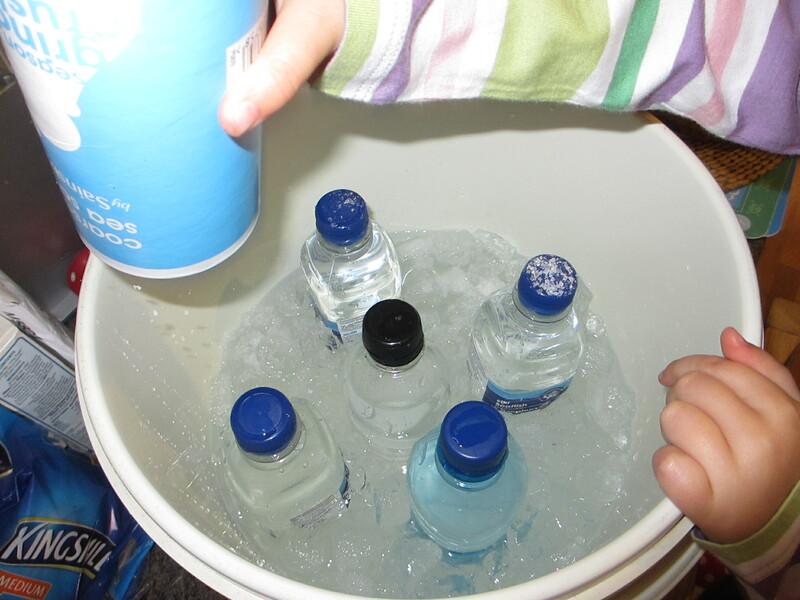 Stand the bottles of water in the bucket and pour in the ice cubes until they almost cover them. You want to cover the bottles just enough that you can still pick them up and also turn them. Mix it up! Salt reduces the freezing point of water and so the ice will melt quite a bit as this goes along. You want to create a bucket of briney slush. This will let the temperature get very low. Now you need to leave your bottles alone. Every ten minutes or so, go and rotate them gently. This is just to make sure the water cools down evenly and is cooled throughout. After about 45 minutes the process should be complete. You should be able to feel that the bucket is very cold to the touch – ice will be starting to form on the outside. Here comes the fun part! Note that if this stuff isn’t working for you then you probably need more salt and ice – or to give it more time to cool down. Supercooled water is just waiting to turn into ice. If you gently pick up one of the bottles and then violently shake it, it will almost instantly turn into ice. 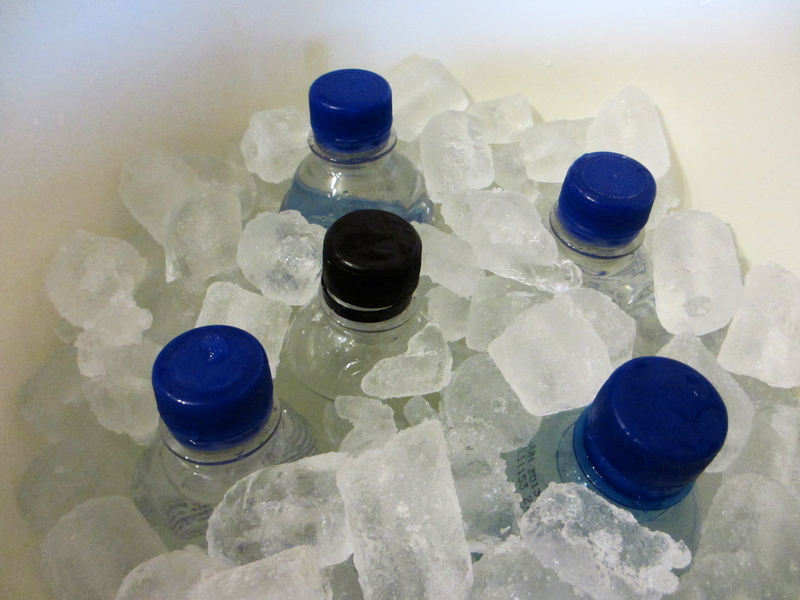 Shaking it creates air bubbles in the bottle on which ice crystals can form. Once a few have started, it’s a runaway process since the best place for ice crystals to form is on other ice crystals. This is pretty amazing and I couldn’t get a good video or photo of this happening – it was too quick. What we did a lot of was make ice towers! It’s a seemingly magical process that my four-year-old thought was brilliant. To do this you simply take an ice cube and pour supercooled water onto it. (It’s best to place this on something to contain the excess water!). As the water touches the ice it quickly crystallises and starts to create a tower, building upward as you pour. It’s pretty cool (ahem!). Again: the best place for ice crystals to form is on other ice crystals. The towers were quite beautiful too, made of pure, transparent crystals. They were quite solid for a minute or two and then quicky disintegrated (it was 22°C in our house). Salt is used to grit roads in the Winter because it lowers the freezing point if water and makes the ice melt. In the process it actually lowers the temperature further. If you have a thermometer handy then you can watch the water in the bucket drop in temperature as this experiment progresses. This is why this method works to supercool the bottles – the temperature quickly dropped to around -8°C in our bucket and the slushy mixture makes good contact with the outside of the bottles for quick cooling of the water inside. I suppose this might work in the freezer but opening the lid our of chest freezer would disrupt the cooling and frankly the slushy brine is half the fun! My four-year-old loved doing this. We talked about molecules slowing down and ice forming. We talked about the Winter and frozen puddles, road gritters, and cold drinks. Mixing in the salt and ice is fun and making ice towers blew her away. 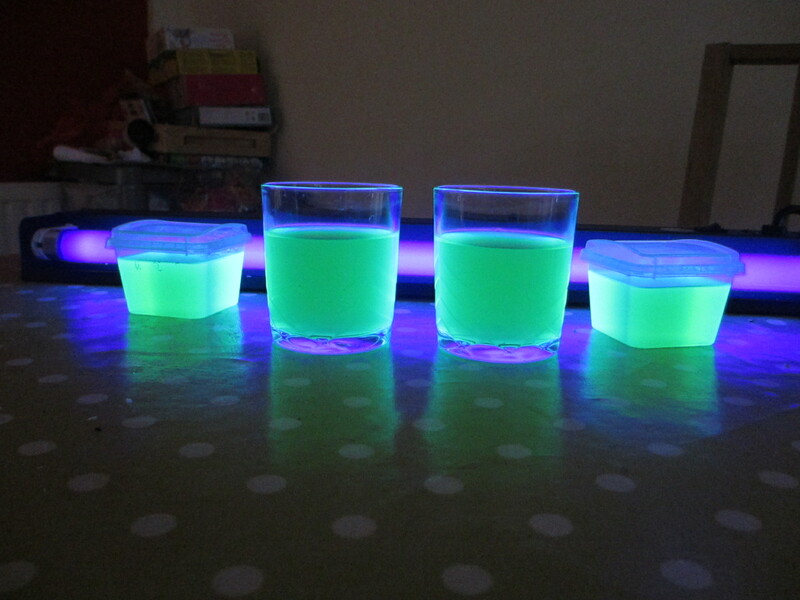 The 45-minute wait was the hardest part for her – so we made glowing jelly at the same time! I’m not sure if supercooling is necessarily something that young kids will take away from this but there’s lots to understand about ice and freezing. The ice towers were very exciting and next time I do this I’ll have some gloves ready for the kids so they can do the pouring and shaking – the bottles are too cold otherwise. I cannot fathom why anybody prefers Fahrenheit, which starts with frozen brine at 0°F, the freezing point of water at 32°F and it places the boiling point of water 180° higher at 212°F. Because those are all such handy numbers. Human ‘blood-heat’ was supposed to be at 100°F but things got rearranged – so now it seems odd. Sheesh. Here’s a really simple and fun experiment to do at home: make glowing jelly (or jello, American friends)! The method is really easy – you’re just making jelly – but you do need some kind of UV light source to see the effects. Boil 100ml of water and mix with the jelly so it all dissolves. Top up with cold water up to 300ml. Add 300ml of tonic water. Mix it up really well and put it in the fridge. 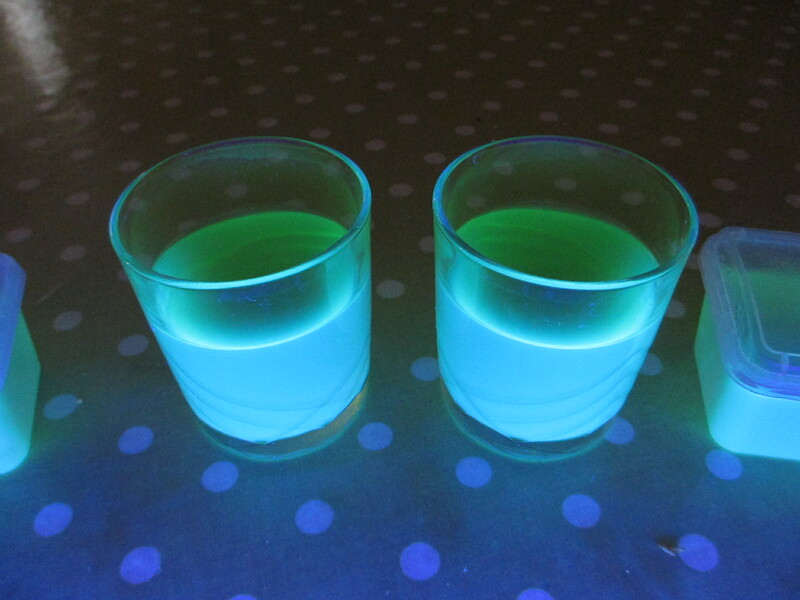 Quinine glows a blue-ish colour under UV light so I used green jelly to maximise the effect. I’m assuming that the jelly acts as a kind of filter to the fluorescence, so using red jelly would probably result in a very poor glowing jelly. And nobody wants that. There was no blue jelly in the shop; not much blue food in general, actually. Fluorescence occurs in some materials when they absorb high-energy light photons and then re-emit that energy as lower-energy photons. In this case, the quinine is absorbing UV photons and re-emitting them as visible light (UV light is higher-energy than optical light). The results were pretty much awesome. You can see our glowing green jelly above. It tasted great too. 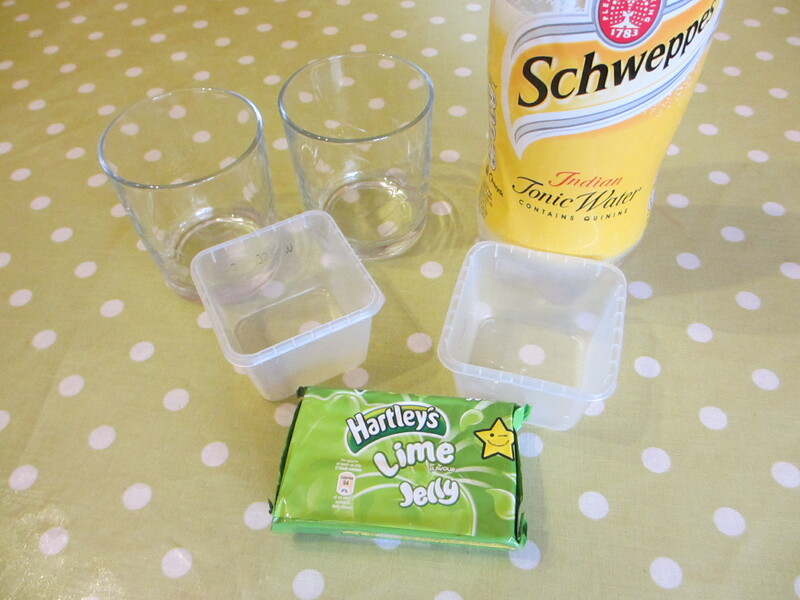 Lime turned out to be a good flavour to accompany the tonic water, which would normally have a bitter taste. The kids gobbled it up – under the glow of the UV lamp. This project was really quick and easy and the kids loved it! I think there may be glowing jelly – and maybe other glowing foods – at Halloween this year. Here’s a fun experiment you can try using the contents of your kitchen cupboard. Explore the effects of different densities and learn about refraction, viscosity and the planet Jupiter. You’ll need five different liquids; I used golden syrup, dishwashing liquid, water, alcohol and vegetable oil. I also used some food colouring to make it easier to see what was going on (and because the alcohol I use is Tequila which looks just like water). If you have a chopstick around that will also be handy – but any stirring implement will do. Instead of golden syrup you could use treacle or corn syrup: something gloopy and messy. For alcohol you can use almost anything from spirits to rubbing alcohol. If you’re a kid, please ask whoever is in charge before raiding the drinks cabinet (this is generally a good rule in life). You will be putting all of these into one glass, so find a tall one that is reasonably straight-sided. The more angled the edges of the glass are, the more of each liquid you will need as you go along – this could get tricky. You’ll need about one sixth of a glass worth of each liquid, as shown above. Start with the glass containing the syrup and carefully pour the dishwashing liquid into it. You want to pour down the sides of the glass if possible, this will help stop the two liquids mixing. For these two it should be easy enough as they are both fairly thick. Let the glass stand for a moment and you should see that the two liquids make layers in the glass. Now we add the rest of the liquids, in the order shown in the image at the top. Pouring down the side of the glass may not be enough to prevent these remaining liquids from mixing. It helped me to use a teaspoon. Hold the teaspoon inside the glass just above the surface and pour gently into the spoon, allowing the liquid to pour over the sides. In this way, the liquid you are pouring is placed on top of the existing ones much more gently. Be careful and pour slowly and you should be fine. You can always practice your pouring in another glass if you want to. Hopefully you will end up with a nice, layered glass of different coloured liquids. Why? Well it is all to do with density – the mass per volume – of the liquids. Liquids at the bottom have higher densities than those at the top. All liquids have different densities as well many other properties. We can explore some of them using our layered glass. Take a chopstick, or similar stick-like object and insert it into the glass. Don’t disturb the glass too much though. See how the chopstick looks now. Each liquid bends the light coming through the glass in a different way. This is related to the density but is actually a property of all materials called the refractive index. In general the refractive index increases with density. It is a measure of how much light is bent as it passes through a material. We can also explore two more properties of liquids: viscosity and miscibility. Take hold of the chopstick and stir the glass up. Stir well, but try not to spill the contents. Watch and feel how the liquids mix. You’ll notice that it is very hard to mix the syrup and that you can also feel the washing up liquid dragging against your stirring. This is because heavy liquids tend to be viscous. Viscosity is the measure of a liquid’s resistance to you changing its shape. The syrup is highly viscous, i.e. it resists your chopstick very strongly. The water, alcohol and oil offer almost no noticeable resistance at all, by comparison. This is because they are all similarly viscous and we are all used to how water ‘feels’. After you stop stirring the glass, wait a few moments for it to settle down again. Watch it during this time and you will see it appear to organise itself. Miscibility is the measure of how well two substances mix. Water and alcohol are miscible because they mix together just fine. You can see that they do not separate out again after you stop stirring. Water and oil are immiscible. This means that they do not mix. It doesn’t take long after you stop stirring for the oil to float back to the top. Would you say that the washing up liquid is miscible with any of the others? I found it hard to tell because both it and the syrup were so viscous I could not stir them up very easily! Liquids, and their many properties, shape all sorts of things in the world around you. 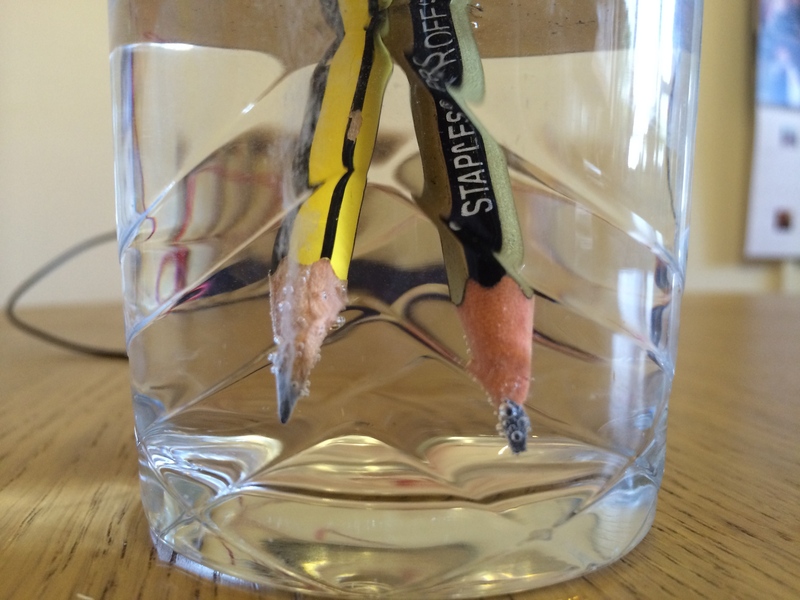 Refraction, density, viscosity and miscibility are important in our everyday lives. Anyone who has had to clean oil-based paints off a brush with water knows something about miscibility. If you have tried to hook something out of a pond or swimming pool who have experience the frustration of refraction. You also know that you float in the sea, this is because of the difference in density between the salt water in the sea and the water in your body. Have you ever had to wait for ketchup to slowly pour out of a bottle because of its high viscosity? In astronomy you can see some of these properties in action. The planet Jupiter has a series of coloured bands running across its surface. The different fluids that make up Jupiter’s enormous mass do not mix well because of their make-up. The hydrogen- and helium-based fluids are thought not to be miscible and this is part of the reason that we see the striking bands or colour on the planet’s surface. Refraction and density are a big problem when observing through a telescope. The air becomes unevenly heated and this creates patches of the sky with higher refractive indices than others. Pollution also changes the refractive index of the air. The result is a fuzziness that astronomers call the ‘seeing’. Because of this, astronomers prefer to put telescopes high-up and away from cities with their hot buildings and smog. Viscosity is important in simulations of planet formation. Disks around young stars are made up of different materials and if they get dense enough they will become highly viscous and drag against the force of gravity as it tries to force them around the central star. The result is that parts of the disk could be dragged inward and this could greatly determine the formation and evolution of planets. Note: This experiment involves sharp objects and should only be performed by children if under supervision. As long as care is taken, this is a fun experiment with effective results. It can be done without the razor blades, but the results are not as good. Spectrometers are used, like prisms, to spread light out into the component colours. This enables us to understand the compositions of everything from stars to streetlights. Here I show you how to make your own spectrometer and give you a few examples of what you can see with it. Cut a small square hole (approx 1cm across) in the middle of one of your 8cm x 8cm black cards. Break the CD into pieces, just snap it. You’ll need a section of the broken CD that can nicely cover the 1cm hole in your card. Using a bit of sticky tape, peel away any cover remaining on the piece of CD, so that it is transparent. Use tape to stick it over the hole, creating a sort of window. This will be our diffraction grating. Using a stanley knife, cut a slit in the middle of the other piece of 8cm x 8cm black card. This slit should be about 2cm long and just a few millimetres wide. Tape the the two razor blades either side of the slit. 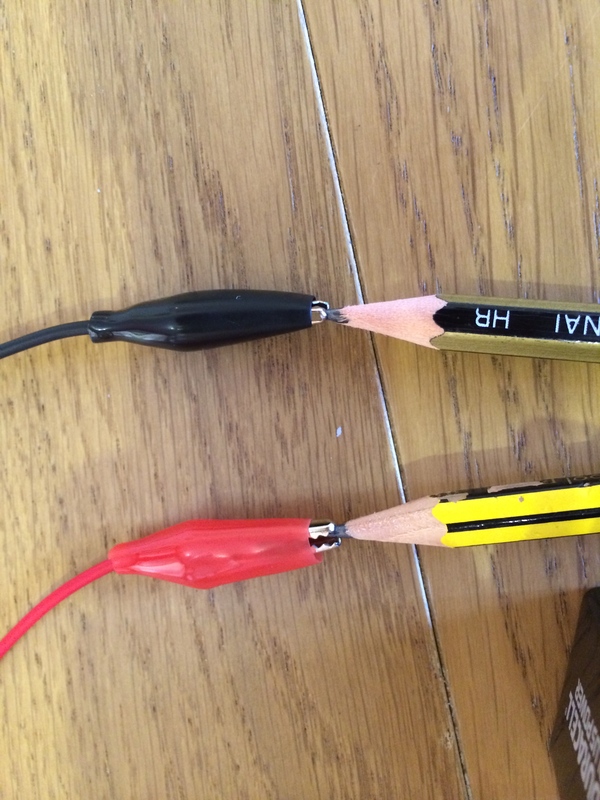 They should make an even narrower slit, just 1mm or less if possible! The aim is create a very fine, narrow slit though which light can travel. Make sure the blades are securely attached with tape for safety. This is the easy bit! You now attach the two square cards to either end of the tube using the dark tape. You have to attach it in such a way that no light is let into the tube accidentally (hence the dark tape). When you look through the diffraction grating, you only want to see light coming from the slit. The best way to see how this works is to use daylight. Just point the spectrometer toward a window during the day or up at a cloud if you’re outside. You should not ever look directly at the Sun. You should see a nice, smooth spectrum (rainbow) somewhere in your field of view in the tube. Here is a photo of a cloud taken through my own spectrometer. The bright white light is the slit and spectrum is just off to one side. When light enters the tube though the slit it spreads out – all waves do this when passing through small slits. The CD then makes the separate colours visisble to your eye. You see a nice, even spectrum from daylight sources because daylight is made up of all the colours of visible light from the Sun. Once you can see this pattern, you can start trying to find the spectra of other things. In our physics lab we have lamps of different chemical make-ups. These let us see pure light from different sources. Here are a few I took today, all photos taken by my own camera through my own, homemade spectrometer. Here is the spectrum for Zinc, which you can see contains some red and blue but very little green. Cadmium is very distinctive, with short sections of each of the three primary colours and very little between them. It is less spread out than Zinc. There is a big gap between the green and red sections. Krypton is seen to be fainter than the others here, but the spectrum is still visible. The blue section has become much more violet or indigo here and the green is greener than it was in Cadmium. This is how astronomers know what stars are made of. They use advanced spectrometers to measure the spectrum of stars and pull out the ‘fingerprint’ patterns of colour that you see above. Each element has a unique set of spectral lines (colours) and these can identify the presence of different chemicals in stars, nebulae and just about everything else. This is the whole spectrum of the Sun. It is so detailed that it had to spread onto multiple lines to see it properly! You’ll see that in fact it is not perfectly evenly spread out as I suggested earlier. This was taken with a very advanced spectrometer that has a greatly increased sensitivity compared to one made here, but its based on the same principles. Compare daylight to a lightbulb. Different light bulbs look different (that’s why energy saving bulbs light up the room in a different way). LEDs from computers or remote controls (these give very pure spectra, often only one colour). Have fun with your spectrometer and why not try and take a photo through it? It worked fairly well for me. I’d love to see any photos you take with it, or of it. Let me know how you get on. Thanks to the Science Made Simple team for this great idea! Astronomers studying star formation, like myself, use telescopes that can see though the pretty, optical exteriors of nebulae into the dark interiors where very cold dust radiates in the submillimetre and microwave regimes. Microwaves, fall on the electromagnetic spectrum, between radio waves and infrared waves. They are usually around the size of a few centimetres and you may well be very familiar with them as they are produced by the microwave oven that might just be sitting in your kitchen. Microwave ovens use a particular microwave frequency to excite molecules of water. Since water is present in lots of food and drink, this means that microwaves heat up lots of useful stuff – and they do it quickly. The fact that microwaves are now readily available to most of us in the western world and they are only a few centimetres in length, means that you can measure the speed of light in your very own home. The quickest and tastiest way to perform this little experiment is with marshmallows, but chocolate chips also work. You’ll obviously need a microwave oven as well, and a large, microwaveable dish. You will need a ruler, too. Get your large, microwaveable dish and place a layer of marshmallows at the bottom of it.Remove the turntable from the bottom of the microwave oven. If you don’t, then this experiment will not work at all. If your microwave doesn’t have a turntable, it means that the turning mechanism is elsewhere and you’ll need to find a regular microwave oven to try this experiment. Cook the marshmallows on a low heat for a couple of minutes, or until you see parts of the marshmallows starting to bubble. When you do, remove the dish and take a look at the marshmallows. You ought to see that they have not melted evenly. In fact you should be able to see a regular pattern has formed, drawn out in melted-mallow. It depends on your microwave oven, but you should see a melted/unmelted pattern across the dish in some direction. When I tried it at home, my oven created long melted strips next to long unmelted strips (see above). This regularity is caused by the same mechanism that heats up the food you place into your microwave oven. The appliance generates microwaves which very quickly form standing waves (see animation above) inside the cavity inside, where you put food. As the food rotates around, it passes through the standing wave nodes and this excites the water molecules, heating the food. Take your ruler and measure the distance between the melted parts of the marshmallows. You should find that there is an even pattern of melting and that the distance between them is something like 5 or 6cm. Why? Because that is the distance between the nodes of the standing waves. Without the rotating mechanism, the food does not move around and cook evenly, instead it just heats at the nodal points. Using your marshmallows you have created a ‘map’ of the microwaves in your microwave oven! Finally you need to know the frequency at which your microwave oven operates. It is usually written on the back somewhere in small writing. Most standard microwave ovens operate at 2450 MHz. If you cannot find the value on the back of the oven, you can take it for granted that 2450 MHz is about correct. The distance between the melted sections of the marshmallow is in fact L/2, because there are two nodes for each wave (see animation). So if you have measured 6cm and your oven operates at 2450 MHz, then your measured speed of light is (0.12 x 2450,000,000) 294,000,000 metres per second. The agreed value of the speed of light through a vacuum is 299,792,458 metres per second. See how accurately you can measure it? what could you do to make the experiment better, and thus get a closer answer? …and make yourself sick. Yay!